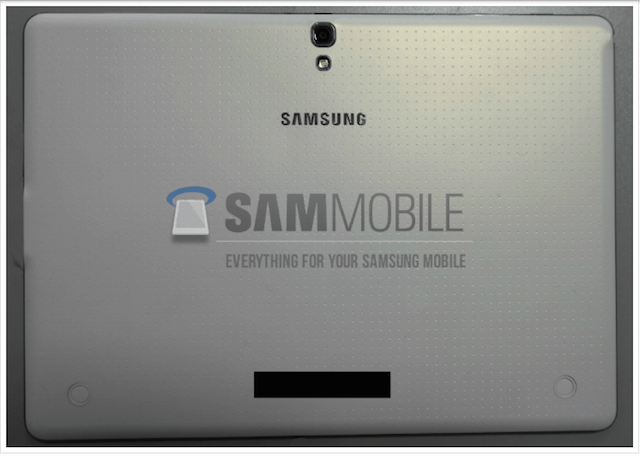 We’ve seen photos of the Samsung’s AMOLED Galaxy Tab S tablet lineup, but we’ve yet to confirm any official leaks. Now, the Galaxy Tab S 8.4 has been confirmed in benchmark tests – which detail factors such as speed, performance, screen resolution, memory, and so on. In recent benchmark testing, new Galaxy tablet performance results have been tested and published, pointing to a tablet that we’ve never seen from Samsung before. First, the Galaxy Tab S 8.4 (model number SM-T700) will feature a Quad HD resolution of 2,560 x 1600 pixels with an 8.4-inch AMOLED display (not Super AMOLED), 3GB RAM, 32GB of internal memory storage, a 2MP front-facing camera and an 8MP rear-facing camera. 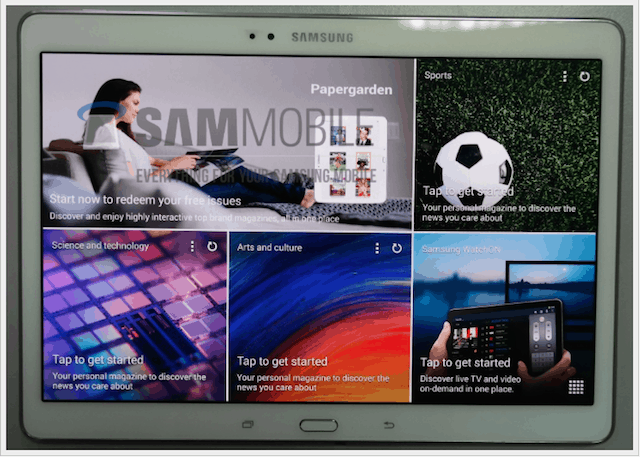 The Galaxy Tab S 8.4 will have a 1.9Ghz Exynos 5 Octa 5420 processor, Samsung’s own processor that is said to utilize all eight processor cores at once. 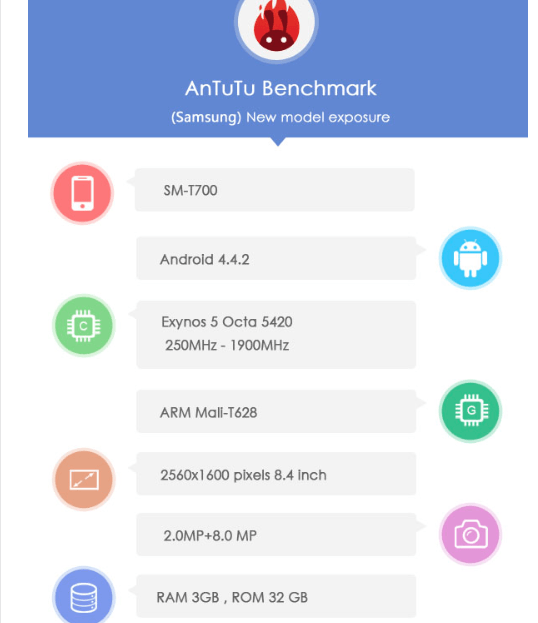 In recent years, it’s been said that Samsung’s octa-core processor only utilized four cores at once. Samsung has been working to improve its processor so that its users get a genuine octa-core processor that functions to its highest capacity. As for the Android update, the Galaxy Tab S 8.4 will run Android 4.4.2 KitKat right out of the box, what is (right now) the most current Android update. There have been clues in recent weeks that Google’s getting ready to unveil Android 4.4.3 KitKat sometime soon (including Google’s Edu Device Setup page, Motorola’s Moto E product announcement, etc. ), but we’ve heard nothing from Google as to the rumored iterative update. The new Samsung tablet is also said to come with a fingerprint scanner embedded in the tablet’s home button and Samsung’s Ultra Power Saving Mode – both of which are found on Samsung’s Galaxy S5. 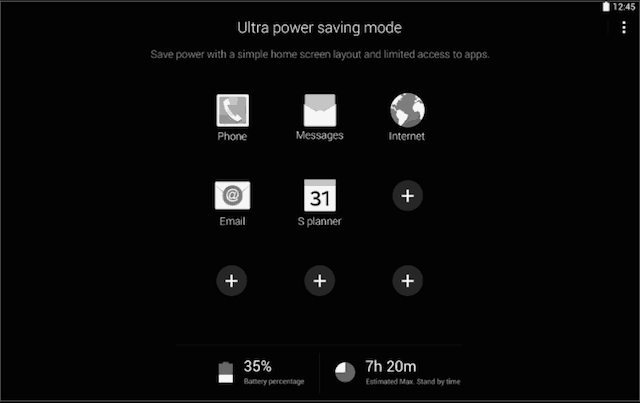 The company’s Ultra Power Saving Mode has become a new feature (alongside of the Power Saving Mode) that allows you to turn off all background applications in order to save battery life. Even with 10% battery life remaining, Samsung has said that you can get at least another day or two of battery life. Power Saving Mode has existed in Samsung’s Galaxy S smartphone lineup for some time now, but it has been tweaked in the Galaxy S5 to allow colors to be dimmed to black and white for battery conservation purposes. As for the back cover, it will sport the same dimpled Galaxy S5 design but also have round connectors on the back of the device that will sit in a tablet cover/keyboard cover. Rumor has it that Samsung will announce the Galaxy S Tab 8.4 tablet on June 12th, along with 10.5-inch and 13.3-inch variants. The Wall Street Journal’s recent interview with Samsung executive J.K. Shin has detailed the event as taking place in New York’s Madison Square Garden and being about “a new line of tablets for the first time.” With benchmark leaks, we can say that the announcement date is not too far off.